Our final demonstration in our 3 part Latitude 44 series was today… Delicious as the first two demonstrations, but with a lot of technical instructions, so I will do my best to report…. 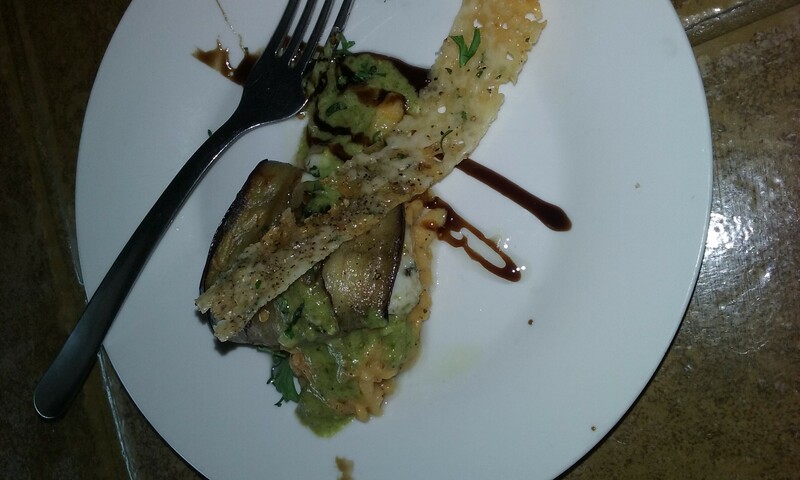 The first thing Chef David Allen worked on was an eggplant roulade stuffed with fresh mozzarella.. Though this tasted phenomenal and looked complicated, it was pretty simple. First David sliced the eggplant (roughly a 1/4″) lengthwise and seasoned it with oil, salt and pepper and then grilled the slices just enough to leave grill marks and soften the slices enough to roll. Then placed fresh mozzarella marinated in olive oil and fresh basil and parsley on the eggplant slices and rolled them up. As the meal was coming together, these rolls were baked just until the were hot through but before the cheese completely melted. We discussed the added taste through grilling and trying this with summer squash as well. To accompany the roulade, David then created a sweet potato spaetzle with cooked mashed sweet potatoes, 2 eggs and flour. Once he had this mixture at a consistency that would hold its shape enough to go into the boiling water (similar consistency to biscuit dough) he “grated” it into boiling salted water, removing it after a few minutes to a ice water bath before sauteing the spaetzle in oil with garlic, salt and pepper. As a garnish, David baked a thin layer of Parmesan cheese until it was browning, then sliced it into strips with a pizza cutter. While it was still pliable he draped the strips in a muffin tin to give the strips some shape and create depth on the plate. This is an easy and tasty garnish and can be done in small rounds. To tie everything together David topped the roulade and spaetzle with a pesto cream sauce, which consisted of onion and garlic, sauteed with white wine and cream that he added prepared pesto to. This garnish was not only tasty, but also bright. A big thanks to Chef David Allen for opening his kitchen to us and showing us a few tricks of the trade! This entry was posted in Uncategorized by Jordy Kivett. Bookmark the permalink.